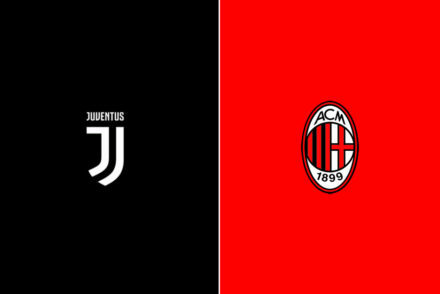 Juventus find themselves in a very familiar situation this weekend. 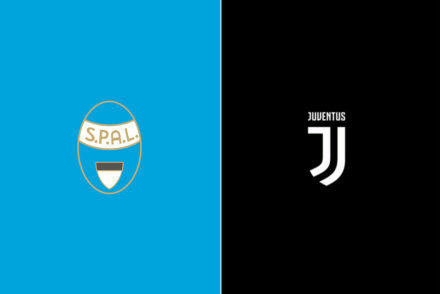 After a disappointing European performance, they face an uneven match up against a smaller Italian side. 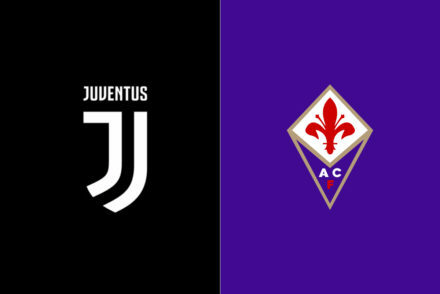 The Palermo game actually begins a quick run of matches in between the next Champions League match, against Olympiakos on November fourth, where Juve play Palermo, Genoa, and Empoli, all in a seven day span. Allegri will need to reach into his deep squad and rotate to make sure the team stays sharp, and Luca Marrone and Romulo’s return to fitness should see them play later in the week. They are probably going to be available for the Palermo game, but are surely not going to start. 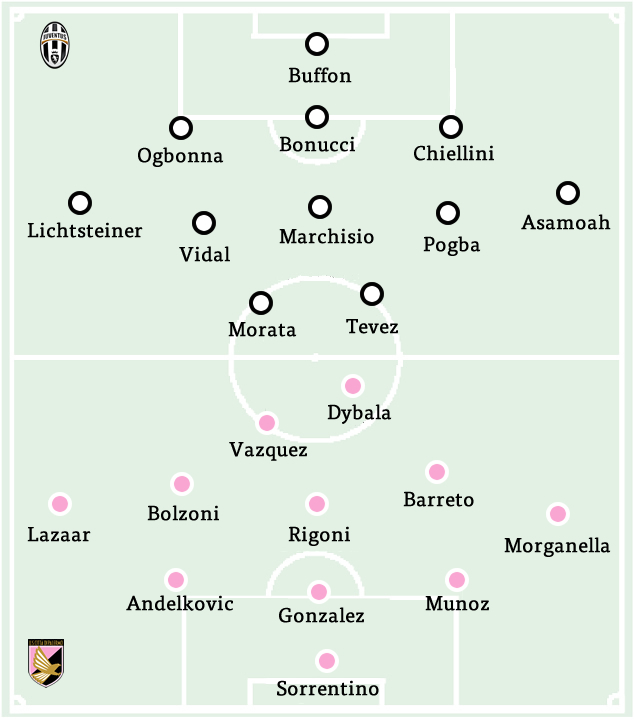 Until then, Allegri is pretty limited in his defense choices with Andrea Barzagli and Martin Caceres both out. So we can expect to see Giorgio Chiellini, Leo Bonucci, and Angelo Ogbonna starting in front of Gianluigi Buffon. Chiellini was the only centerback who had a decent outing in the Champions League this week, so hopefully Bonucci and Ogbonna will repent for their play by having top notch games. Buffon, as always, is a literal wall in front of goal. When he retires perhaps David Hasselhoff will stand on the Buffon Wall and sing some songs. In the midfield Max looks to have learned from his errors in player selection versus Olympiakos and will start Claudio Marchisio over Andrea Pirlo. Pirlo clearly needs to get back into form after his injury, and the next few games will provide chances, but for now we are much better off with Marchisio. Paul Pogba and Arturo Vidal should partner him. I am a bit surprised by Vidal’s selection, and one wonders when Pereyra will begin to exert the pressure on Vidal’s spot that Marchisio has on Pirlo’s. Out wide Max also has limited choices due to injury. Both the previously mentioned Romulo and now Patrice Evra are not fit. Evra recently came down with a muscle issue that will be further examined on Monday, so he will miss the Palermo match. That means we will see Stephan Lichtsteiner and Kwadwo Asamoah starting, the same pair who started versus Olympiakos. In the striking department, there is also some expected change. Alvaro Morata, after his fine performance against Olympiakos, could have potentially stolen Fernando Llorente’s usual starting spot. He is expected to partner Carlos Tevez up top, at least for the Palermo game. He can be expected to score if he plays as he did versus Olympiakos. Palermo come off a lucky but deserved win against Cesena thanks to a goal in the stoppage time. It gave the coach on the hot seat Giuseppe Iachini some breathing room, even if his situation remains (undeservedly) pretty desperate. 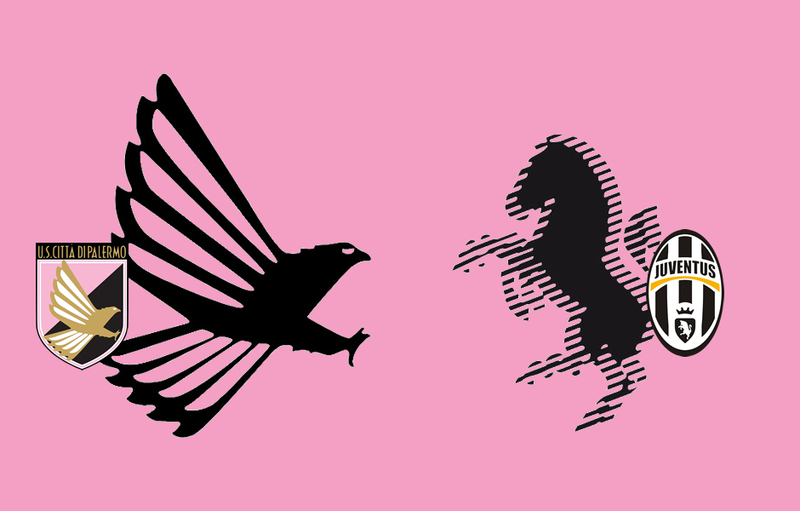 Palermo have collected only six points in seven matches, but they have competed in every game, even in the 0-4 against Lazio, barring the blah performance against Empoli. They have been a little shaky in the back (they conceded 15 goals) but the sample doesn’t really apply to this game. Before they break, they used to field with Sinisa Andelkovic, Claudio Terzi, Zouhair Feddal or Sol Bamba, but they have now recovered Ezequeil Munoz and Giancarlo Gonzalez, who were hurt. It doesn’t necessarily makes them rock-solid, but it’s an improvement. Their strength is clearly upfront: Paulo Dybala and Franco Vazquez have been on fire, combining for five goals and three goals so far. Their mix of speed and technique poses a real threat to the opponents that becomes even bigger when they team up with the brilliant Andrea Belotti, who is used as reference point in the box, while the other two attackers like to move a lot. Iachini can use either 3-5-2 or 3-4-1-2. Common sense suggests that he will use a more conservative approach at home of the champions, but you never know: he’s been bold against Napoli and it allowed him to return home with a point. However, the trident causes balance issues elsewhere, so Iachini will have to ponder this choice. 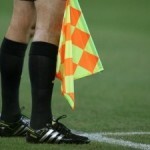 If he will indeed opt for 3-5-2 benching Belotti initially, Edgar Barreto, who is the regular starter but missed the last game due to a mild muscular injury, or Ivaylo Chochev, who showed promising dynamism against Cesena, will battle for the final starting spot in the middle, flanking Luca Rigoni and Francesco Bolzoni. Granddi N’Goyi and Robin Quaison are less likely option. In any case, they’ll have a very muscular and combative midfield. Whether it will be Eros Pisano or Michel Morganella, they’ll field a muscular right wing back, while there will be a more pacey and agile winger on the other side, regardless of who it will be be between Achraf Lazaar, Fabio Daprelà or Emerson. Palermo aren’t afraid of facing their opponents directly and they proved it against Napoli, Inter and Lazio, even if they paid for it against Candreva & co. They are feisty and they have great character: coming back from 3-1 to 3-3 at San Paolo is not ordinary. They haven’t the light heartedness of Sassuolo (they play on the road too), but they are quite similar attitude-wise: they don’t play as the usual team that fights to avoid relegation. The instability caused by the overeager Maurizio Zamparini, who has fired the sporting director Fabio Ceravolo, have put them in an unnecessarily delicate situation: they won’t go down without a fight at the Stadium, that’s for sure.